Slotted sign letters offer changeable lettering with a flat textured face and sharp letter returns (edges). We offer this category of slotted changeable sign letters (slotted letters) in two premium brands, Gemini slotted letters, which is what we will supply if there is no brand, preference and Wagner slotted letters, which is probably the most commonly used brand in the marketplace. Slotted changeable sign letters feature angled slots in the back of the returns (side edges) of the sign letters. These slots allow the sign letters to install easily and remain in place on either Gemini slotted track or Wagner slotted track. Slotted letters are high quality, long lasting changeables that provide that extra 3-D look to your sign, because they are dimensional sign letters. 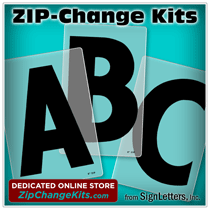 We offer a wide selection of plastic changeable sign letter products. Some of our readerboard letter kits (or individual change letters) are for use on the small changeable message signs common to almost any business, however, these high quality slotted sign letters are referred to as marquee letters, and are commonly used on large theatre signs ( marquee signs ). Some companies with smaller signs also use these slotted letters since they provide a 3-D appearance on the sign surface. 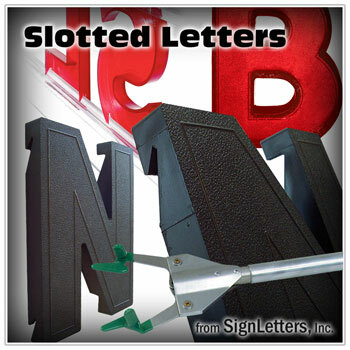 We also offer the replacement thermoformed plastic "Slotted A" sign letters, which are still available on special request. The "Slotted A" letters are essentially SnapLok sign letters with angled slots instead of metal tabs. The "Slotted A" replacement sign letters must be custom quoted, and some replacements may not be available in small quantities.